In her first book of nonfiction, Julia Alvarez takes us behind the scenes and shares the lessons she's learned on her way to becoming an internationally acclaimed novelist. In 1960, when Alvarez was ten years old, her family fled the Dominican Republic. Her father participated in a failed coup attempt against the dictator Rafael Trujillo, and exile to the United States was the only way to save his life. The family settled in New York City, where Dr. Alvarez set up a medical practice in the Bronx while his wife and four daughters set about the business of assimilation--a lifelong struggle. Loss of her native land, language, culture, and extended family formed the thematic basis for two of Julia Alvarez's three best-selling novels--HOW THE GARCIA GIRLS LOST THEIR ACCENTS and its sequel, YO! Her father's revolutionary ties inspired IN THE TIME OF THE BUTTERFLIES, her historical novel about one of Trujillo's most infamous atrocities. 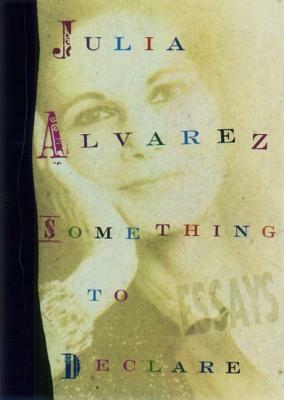 SOMETHING TO DECLARE offers an extraordinary collection of essays that deal with the two big issues of Alvarez's life--growing up with one foot in each culture and writing. The twelve essays that make up "Customs," the first of two parts, examine the specific effects of exile on this writer. The essays are personal--how her maternal grandfather passed along his love of the arts, how the nuclear family-in-exile snuggled down every year to watch the Miss America contest from the parental bed, how Julia feared her family might disown her upon publication of her first novel. In the second half, "Declarations," are twelve essays about writing that range from confession of Alvarez's means of supporting her writing habit to the gritty details of her actual process. Every one of these essays is warm, open, honest, and generous. SOMETHING TO DECLARE will appeal not only to her many fans, but to students of writing at all levels.